A favorite sport quote of mine is: “There’s no ‘I’ in ‘team’, but there is one in the word ‘win’.” Personally, I am a firm believer of this in both business and life. I go out of my way to use “we” when discussing collaborative efforts to stress the value of the group, rather than an individual. I had the great privilege of hosting the Webcast “IT Leadership for the Next Phase of Digital Transformation” recently. 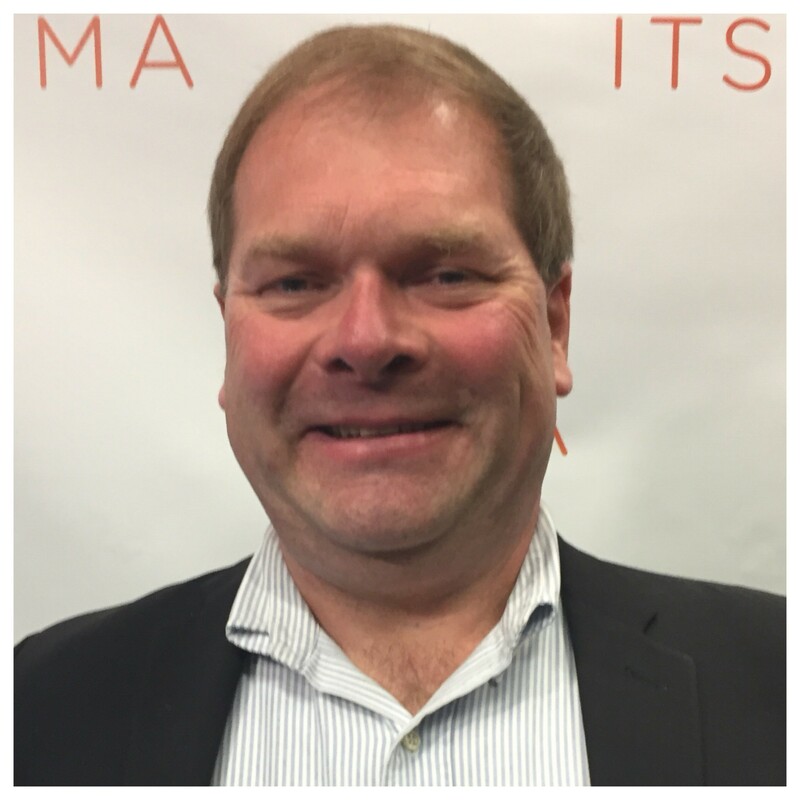 The panel of subject-matter experts included Geoff Scott, the CEO of ASUG and a former CIO. Throughout this talk, I was reminded of how an ecosystem works and the importance of both influence and education that’s involved especially with Digital Transformation. According to Scott, a small segment of executives is still grappling with the concepts of digital transformation. 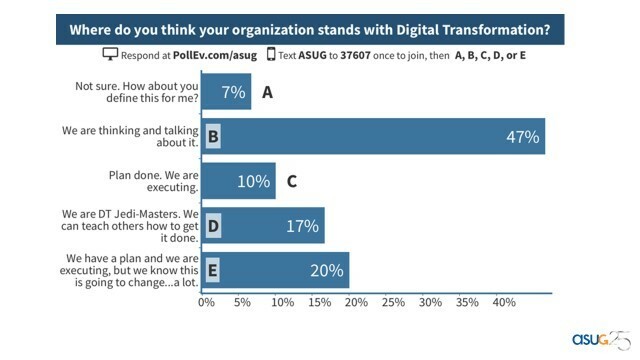 In fact, a recent ASUG survey revealed that nearly half are thinking and actively discussing it with a plan to follow. The rest map almost classically to an innovation adoption curve – a group of “early adopters” and “innovators” who are taking advantage of the benefits of being first movers, and another comprising the “early majority“ who are moving forward and expecting elements of change to ensue. No matter where the ecosystem resides along this bell curve, creating the right business case is key to ensuring success and getting the most of its technology investment. Seizing the opportunity for innovation, but plan for quick adoption to gain the maximum market advantage. The need for speed has never been greater – and the adoption of new technology has never been faster. The recent “Pokémon Go” phenomenon is a classic case in point by taking a mere 21 days to reach the 50 mission user benchmark, which is a key metric of innovation adoption. Digital transformation is real, and we are beyond the hype phase. There is quite a bit of wide-scale digital adoption happening right now – and a large part of the market is planning and executing efforts as indicated by ASUG member research. Take the National Hockey League (NHL), for example. This traditional sports league, which is celebrating their 100th anniversary next year, is massively transforming the fan experience by using analytics powered by Big Data, cloud solutions, and much more. Developing your own framework and leverage a popular technology model to frame digital transformation. 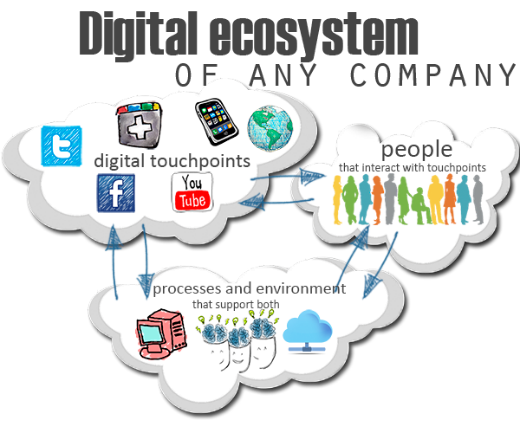 The IDC 3rd Platform and the Gartner Nexus of Forces concepts showcase a model that groups cloud, social media and marketing, analytics, and Big Data with the Internet of Things as a critical innovation accelerator. And for many businesses, they are a firm platform to become familiar, jump into the digital transformation pool with both feet, and actively participate in the digital economy. By leveraging unique project opportunities, companies can bring innovation to fruition and become a change agent and a market leader. Define the cost of failures, examine inefficiencies, and find key areas for simplification. Describe the current state and plan a path to success based upon tangible economic benefits that innovations can address. Telling stories to make the transformation and its benefits real. In an era of unprecedented complexity, we need to simplify. Storytelling allows us to deliver the messages we want while making it easy for audiences to listen without having to connect the dots along the way. Great storytelling uses the proven “Pixar format” (challenge, crisis, and resolution), where real examples supported by benefits and measurements are key. 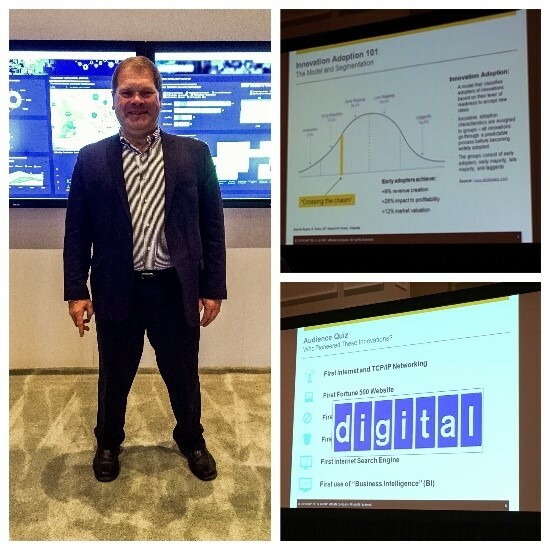 Hear more insights from Geoff Scott and experts from the Economist Intelligence Unit and SAP by watching the replay of “IT Leadership for the Next Phase of Digital Transformation.” Also, don’t miss lesson learned revealed in my presentation, “Building a Business Case for Cloud and Digital Transformation: Issues, Considerations, and Best Practices,” and my “virtual trip report” of tweets and social media coverage I shared during the SAPinsider SAP Projects 2016 event.